App42 Marketing Automation empowers app developers to perform In-App Funnel analysis for tracking user conversions and take informed decisions on top of that. App42 Marketing Automation funnel analysis is built on top of event APIs and it is simple to use in your app. Below are the steps to analyse the Funnel from AppHQ console. Select Marketing Automation from dropdown. 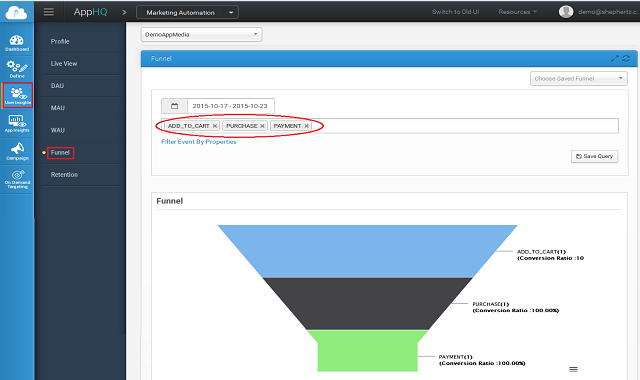 Choose your events to track your activities into the funnel as shown in the picture. Write your events in the order they are occurring in the app. For example First Add to Cart then Purchase and then Payment. Funnel contains information about each layer of the funnel e.g. count of respective event, conversion with respect to top of the funnel event, conversion with respect to previous funnel event along with over all funnel conversion. You can save this funnel for future reference with some specific name by clicking on Save Query option as highlighted in below screenshot.